There are several recipes and sauces that I prepare by feel instead of by measuring, simply because I’ve made them so many times. This sauce is one of those recipes, which I use in tofu dishes, stir frys or noodle dishes once or twice a week. I love using dark toasted sesame oil in this sauce—it imparts a complex and earthy flavor into whatever it’s put on, while the sharp bite of freshly grated ginger balances everything else out perfectly. Heat the sesame oil in a small saute pan over low heat. Throw in the sliced shallots and saute for about 4 minutes. Add in the minced garlic and grated ginger and saute for about 3 minutes. Increase the heat to medium high. When it has sizzled for about a minute, add in the mirin or broth to deglaze the pan, then reduce the heat back down to low. Add in the soy sauce, vinegar, agave and sriracha and stir to combine. Remove from the heat and set aside. In another small pot, bring plenty of water to a boil. Add in the soba, stirring to prevent sticking, and boil for about 4 minutes. Test a noodle to make sure it’s ready before rinsing it thoroughly in a strainer under cold water. 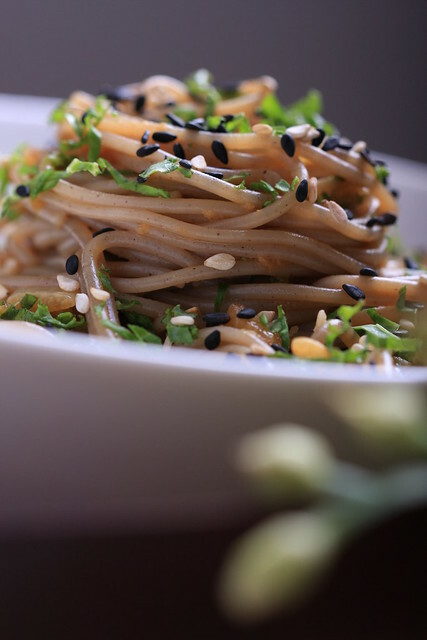 Toss the noodles with the sauce and sprinkle with the minced kale and sesame seeds. Serve by itself or with a side of simple sauteed tofu. these sound awesome, I'm a big fan of ginger. Beautiful pictures too! I think I'm in heaven. I've been eating a lot of soba noodles recently and now I'm going to try this sauce. Gorgeous photos! Beautiful pictures! Makes me want some soba! Beautiful picture! 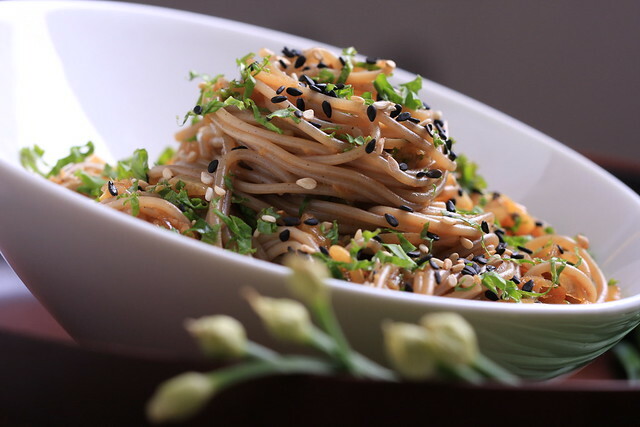 I just love soba noodles! What goregous pictures you have! I'm not that much of a fan of soba noodles but I'm willing to give this a try. some of my very favorite flavors here, now I want this for lunch! This definitely looks like something I would enjoy! beautiful. i think i'll make this and add a veggie and tofu!